A perfect blend of competition and elite training. 2-hours per week of team practices and at 8-10 game (6-week) league and an end-of-season Tournament . 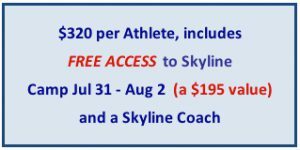 In addition, you will receive Free Access to a Skyline Camp. This is a great value, unbeatable training and a great opportunity to get to know our Skyline staff! You may signup as a team or come to one of our Tryouts to get placed on a team. You may provide your own coach or Skyline can also provide a coach for your team!!! Summer II Individual Tryout Date: No individual tryout hosted, we will only accept pre registered teams for Summer II. If you do not have a team: We will only be accepting Pre Registered teams for Summer II. Payment of $320 per athlete is required at the time the form is turned in. You may have as few as seve (7) and as many as twelve (12) athletes on your roster. Practices Days: we have practice times available Sunday-Thursday. Please have your team rep or coach request a practice day. 2-hour team practice once a week. One of our top coaches will lead the Competition & Training Camp. Below is a link to the Upcoming Leagues. Please check back as this list is updated often.